Dr. Dan Myers now welcomes new patients for a custom bridge and dental crown in Sandy Springs, GA, with or without a referral. 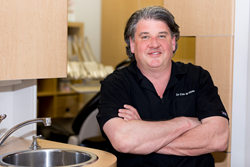 Dr. Myers is a skilled cosmetic dentist with decades of experience placing dental implants, creating custom tooth restorations and offering other cosmetic procedures. As a dedicated cosmetic dentist, Dr. Myers has extensive experience improving the function and appearance of patients’ smiles with the help of natural-looking restorations.